Multiple screen installation version of Collision. Here shown at Twentse Welle Museum during the Gogbot Steampunk event. A woman pours water from a jar into the mouth of another woman, who receives it kneeling down. Two naked men go after each other in a wrestling match. Around 1887, Eadweard Muybridge made photographic analyses of people in motion (Human Locomotion). He divided one unit of motion into 12 photographs, captured with a shutter speed of 1/1000, unprecedented at the time. He put the nudes in front of a black background with a white grid, so he could precisely measure their movements. 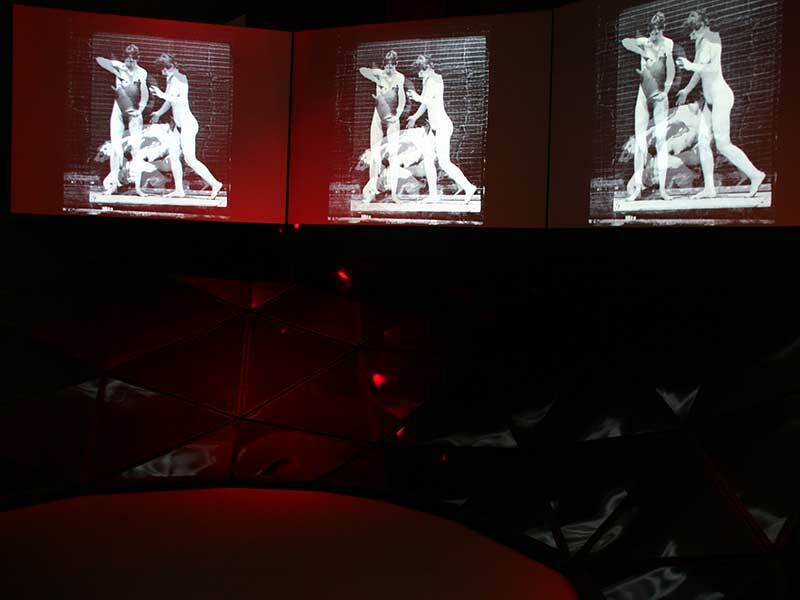 Muybridge’s scientific studies became a rewarding subject for painters and draughtsmen. 70 years later, for example, artist Francis Bacon painted distorted human figures in the intervals between the frames (Two Figures). The wrestling match took on a sexual connotation. The men look beyond the frame, as if they are looking into the mirror of their own pleasure. Another half a century later, Michiel van Bakel reinterprets the human encounters in the antique photographs by means of computer-generated morphing. The quietly flowing movements of the two women with the jar are abruptly crosscut with the scuffling men. Tenderness and sensuality, intimacy and violence vie for the eye. The illusion of movement seems to turn to chaos. But from the flicker of the battling sexes, a new and ambiguous image emerges. Digitally morphed and edited scans of printed photographs by Eadweard Muybridge. Industrial soundscape composed of the filtered sounds that a suspension bridge generates, recorded with contact microphone directly attached to the cables.